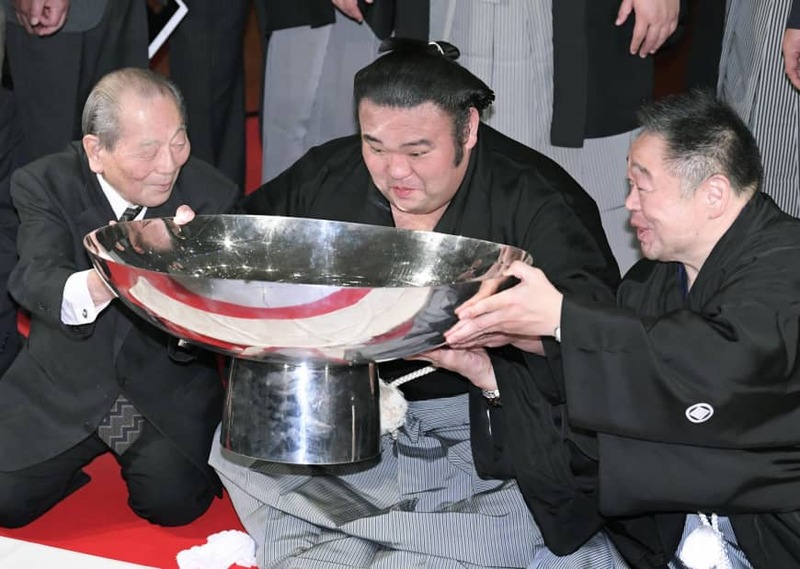 Takakeisho’s victory in the Kyushu Grand Sumo Tournament made him the third wrestler to lift a maiden Emperor’s Cup in 2018. Sumo hasn’t seen a breakthrough on that scale in nearly two decades. Not since Musoyama, Takatoriki and Kaio triumphed in January, March and May of 2000, respectively, have three championships been taken by first-time winners in the same year. Takakeisho also emerged victorious while ranked at komusubi. Of the four ranks in the top division, komusubi is the one with the fewest championships by far. That, of course, is mainly due to the fact that there are normally only two men at the rank and their schedule is brutally tough. Just nine of 489 tournaments since 1909 have finished with a komusubi as champion — a success rate of 1.6 percent. As interesting as those figures might be, there is one other number with a far greater significance: 22. That’s Takakeisho’s age and it’s important because, along with the fact that Mitakeumi is just 25 years old, it heralds the arrival of sumo’s next generation. While Tochinoshin’s win in the January meet was impressive in both technique and perseverance, at 31 the big Georgian isn’t much younger than the three yokozuna. For Tochinoshin, that title win, along with ozeki promotion later in the year, always felt like the culmination of a process. Few people talked seriously about a run at yokozuna promotion, or of Tochinoshin being the new face of the sport. With Takakeisho, however, things feel different. A full decade younger than Kisenosato and 11 years junior to both Hakuho and Kakuryu, Takakeisho has a chance to be a major force in sumo over the next five to 10 years. Along with his youth, the speed at which he achieved his first title is significant. It took the Hyogo Prefecture native less than four years from his debut to record a first tournament win. Lifting the Emperor’s Cup in your early 20’s within the first 25-30 tournaments of a career which started at the bottom of the banzuke is the kind of success often seen from future ozeki and yokozuna. Takakeisho still needs seasoning, and he’ll meet far tougher competition once the three yokozuna return to the ring. But even if he takes a while to reach ozeki, the Chiganoura stable wrestler figures to feature near the top of the banzuke for the next seven to 10 years, at least. 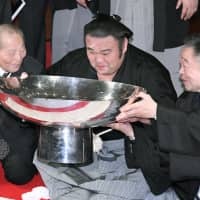 Since joining sumo in 2014, Takakeisho has won titles in four of the lower five divisions, recorded three wins over yokozuna and picked up five special prizes. All noteworthy achievements for a young wrestler with limited experience. In theory, 11 or 12 wins in January should see him join Takayasu — the man he pipped to the post in Fukuoka — at sumo’s second-highest rank. That ozeki, now 28, missed a glorious chance to record both his highest-ever win total and his first career title. Prior to the tournament, I wondered whether Takayasu could elevate his game enough to break through to the 13-win level. Despite falling short this time out, the Ibaraki Prefecture native remains one of the best rikishi on the banzuke, and opportunities will come again if he can maintain his current level. At 28, the Taganoura stable veteran is probably just young enough to benefit from the age and injury issues that are taking an increasing toll on the three yokozuna. Whether he can still be considered a part of the Takakeisho-led new wave, though, is debatable. Mitakeumi, with a title already under his belt, is three years behind the ozeki, and rising stars Asanoyama and Onosho are younger still at 24 and 22, respectively. What’s clear is that if Takayasu wants to be part of the next generation rather than swept away by it, he needs to win a tournament very soon. Right now he is at peak sumo age, sandwiched between a declining legend and several rising stars. This is his time to shrine. Takakeisho, while looking like a future ozeki, doesn’t quite seem to have the all-round ability, or indeed the size, to dominate sumo or attain yokozuna promotion. Actually, there doesn’t appear to be a surefire future yokozuna ready to step up anywhere in the sport right now. A lot of the men listed above have potential, but no one leaps out at you like Asashoryu or Hakuho did when they were in the lower divisions. Indeed, the various title winners sumo has seen over the past year might be a sign that not only is a generational shift coming, but that the new cohort, while containing a lot of standout wrestlers, lacks a dominant force who will preside over the sport for the next five to seven years. The downside is that such parity comes at the expense of a chance to watch living legends like Hakuho, but as we’ve seen this year the absence of top-rankers always leads to closer-fought and more exciting tournaments with unexpected outcomes and surprise winners. Right now it looks as though 2018 was just the start. It’s not a stretch to imagine next year might see six different winners including at least a couple more first-time champions.